I found this Lipton day of the week tea at the Japanese grocery store last fall and I’ve been enjoying it all last week. It’s kind of fun to try a new flavor every day. (Or is it just a long winter and I’m looking for some excitement in my afternoon beverage?) I liked the sakura the best, with the créme brûlée a close second. The flavors are very subtle. We are totally a coffee household and we’ve finally broken our daily Dunkin Donuts habit and have been making our coffee at home for about a year now. When Naoto is home, he also makes us each a cup of tea in the early afternoon. He always drinks green tea or matcha and I always have black tea. (I only drink black tea.) It’s become a nice little routine in our day. I bought a few other teas to try (including a yuzu one!) so I’ll share those soon. Do you have a favorite tea? Usually, I drink Barry’s or (flavorless) loose leaf tea from a shop in our neighborhood if I feel like drinking a whole pot. We really hit the sweet spot during our trip to Japan this year. I was able to shop for Halloween and fall things, as well as planners, Christmas, and New Years. 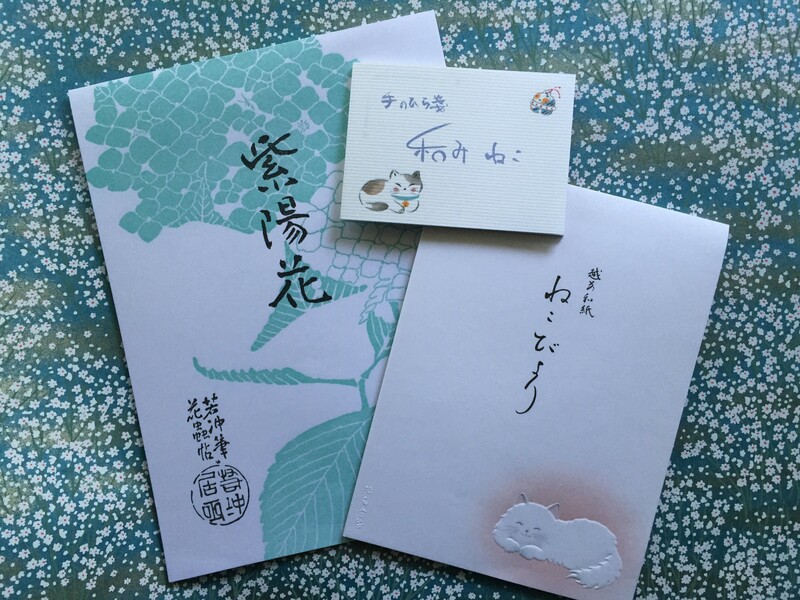 If you’ve been around for awhile, you may remember this post that explains the Japanese tradition of sending nengajo, or new years postcards. We found the regular New Years postcards (the two on the right) at Itoya. 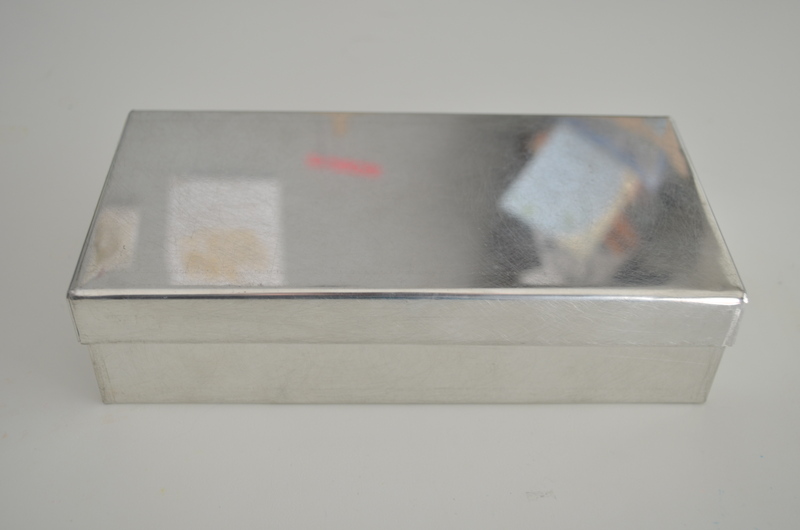 Many stationery stores offer printing services for New Years cards. 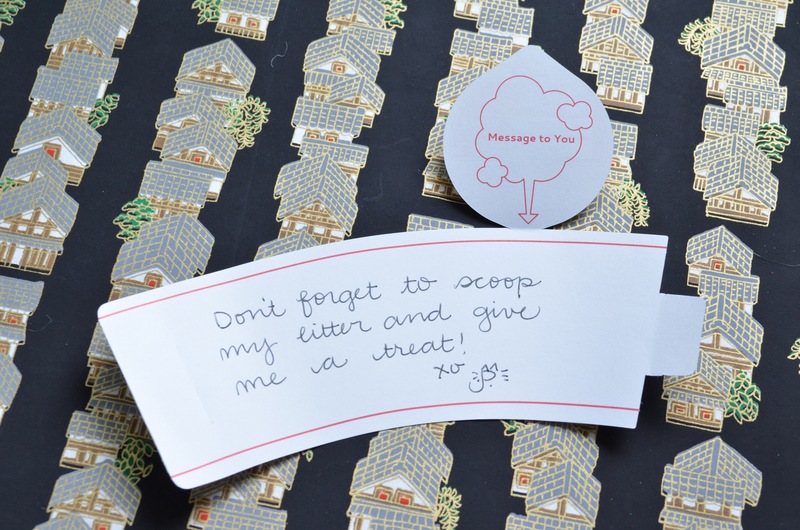 We could have ordered something personalized if we had more time (and wanted to send a bunch.) 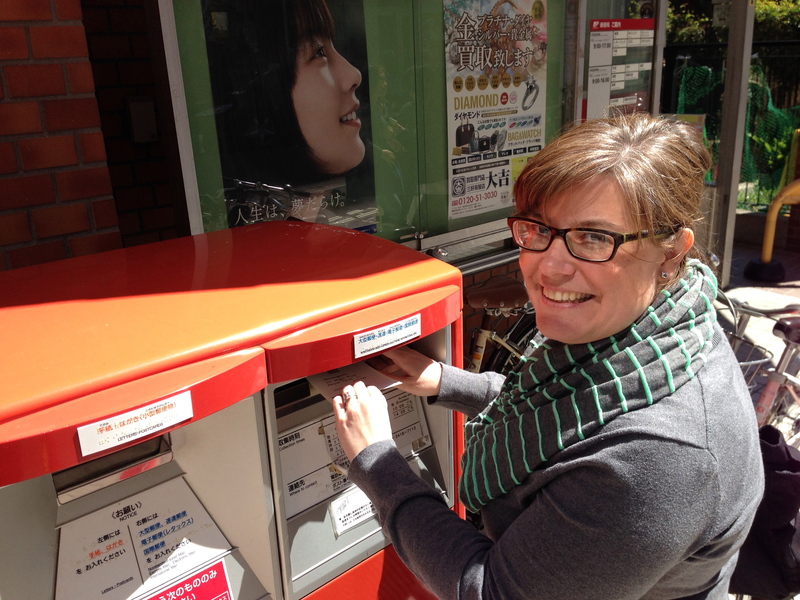 And on our very last day and our very last trip to the post office, we saw the Japan mailbox postcard with the boar. There were Christmas ones too. I just love these cards…it’s always fun to visit the different neighborhood post offices to see what they have available. There’s usually a seasonal one and sometimes regions have their own styles. I picked up a couple of styles of stickers with Japanese new year symbols and the little boar. From left to right: a paddle (I thought it was a bottle of sake, which is why it’s upside down in my picture) for hanetsuki, which is a game like badminton played on new year day, a drum that brings good luck, the boars, and an ema, a placard where you can write a new years wish and hang it at the shrine. A kite, the boar, and kadomatsu, a bamboo arrangement common for new year. 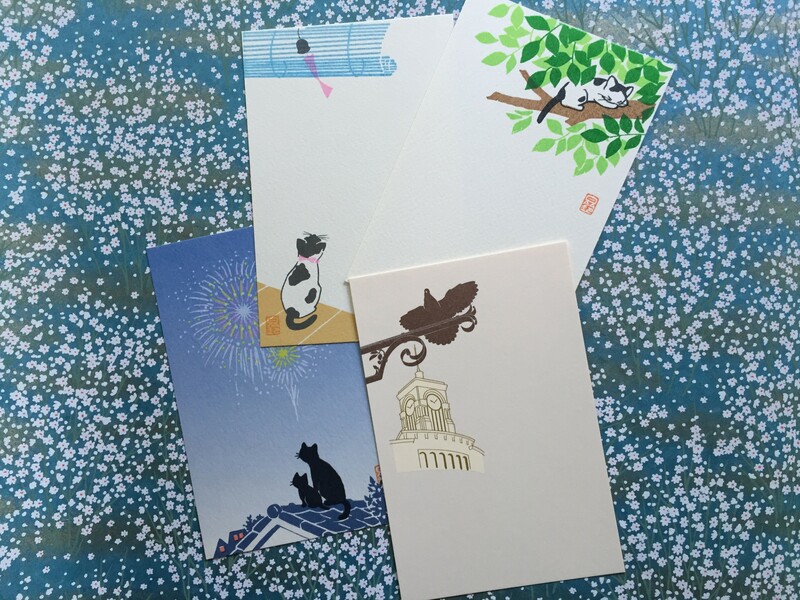 I put all of the postcards in envelopes because of the odd shape of the post boxes and because Japanese postcards are oriented vertically instead of horizontally. I didn’t feel like making weird adjustments on the cards to meet USPS standards, and also this way, I could decorate the envelopes, too. Happy New Year! May your mailbox be full in 2019! P.S. If you’re interested in seeing our New Years cards from the past, here’s a link to those posts. 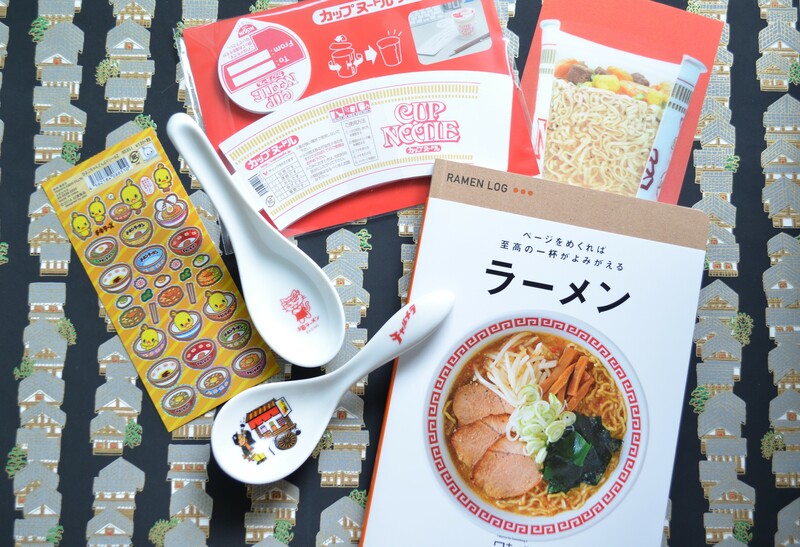 We picked up a few silly treats during our visits to the Ramen Museum and the Cup Noodles Museum. I’m a sucker for a good gift shop and both museums had few offerings but some really fun stuff. I try to get something useful or something we can use up, but I don’t always succeed. We each chose a porcelain ramen spoon at the Ramen Museum. 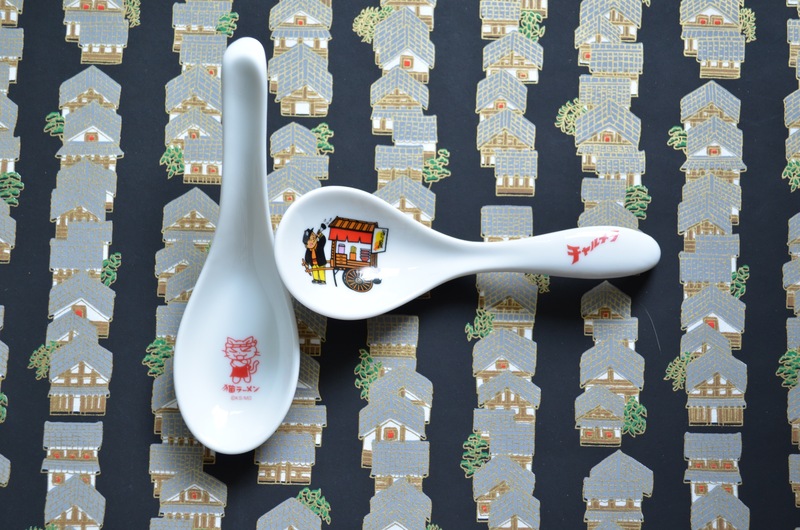 We will most likely use them as soup spoons, but maybe they will inspire us to make ramen at home? They also sold ramen bowls, but spoons took up much less space in our suitcase! 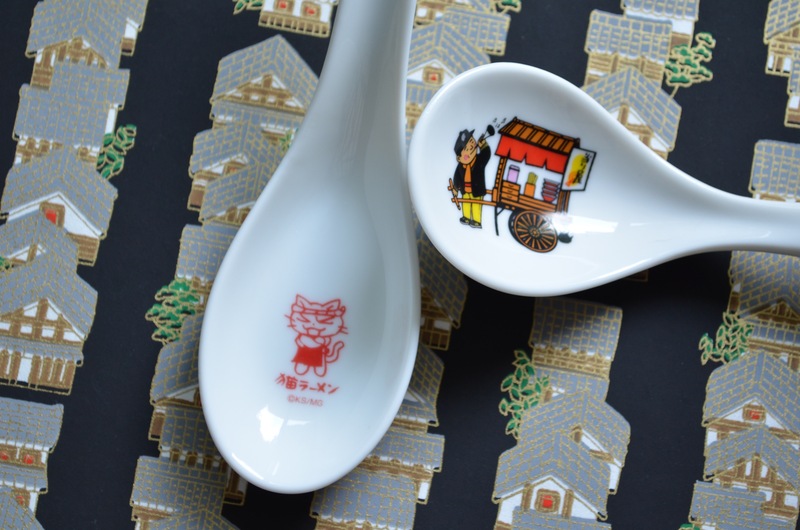 The images on the spoons are logos from old Japanese ramen shops. We thought the ramen cart was classic and of course, I chose the ramen chef cat. 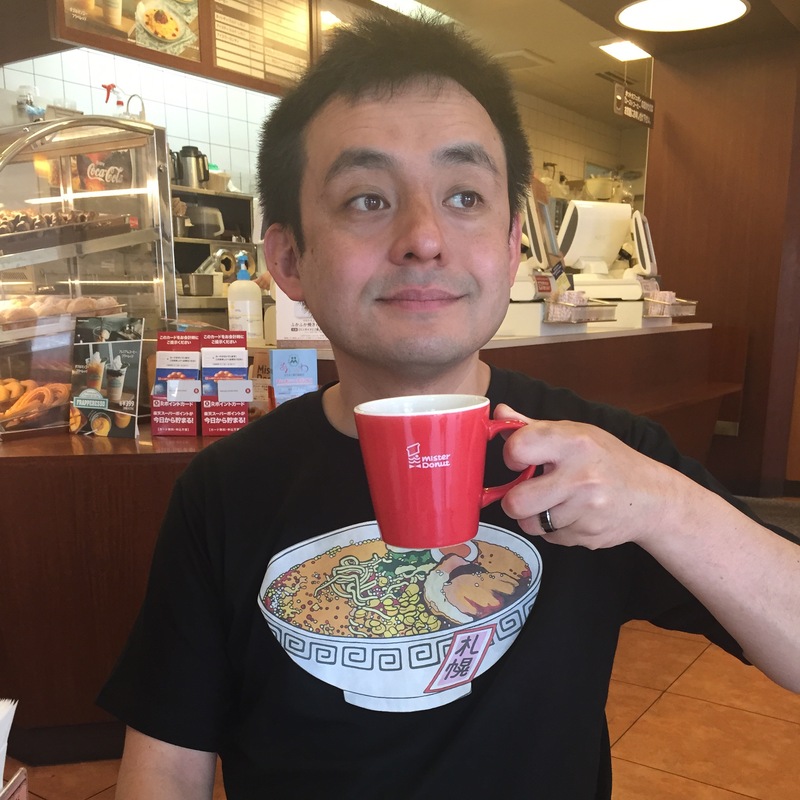 Naoto got a ramen t-shirt (he’s sporting it at Mister Donut in the picture above). Hisae told him he looked like an American tourist because Japanese men do not wear t-shirts with pictures on them…I guess that’s why we had to sit in the English-speaking room at Maisen! 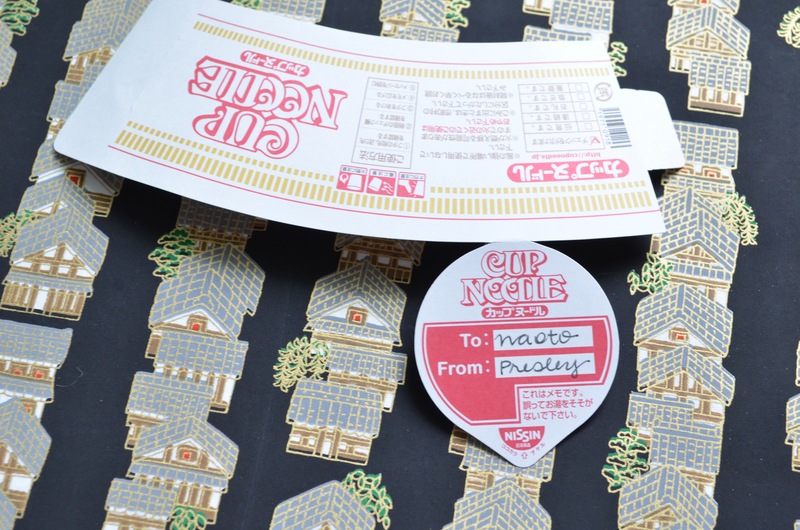 The Cup Noodles Museum had a few paper-y delights for me. I picked up a few pencils while I was in Japan this time. 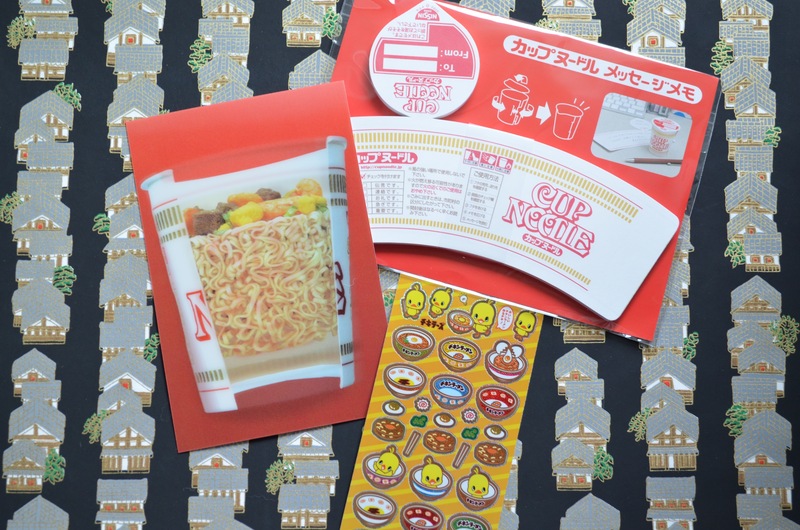 The Cup Noodles Museum logo pencil was one of them and I thought these build-your-own-ramen stickers were cute. 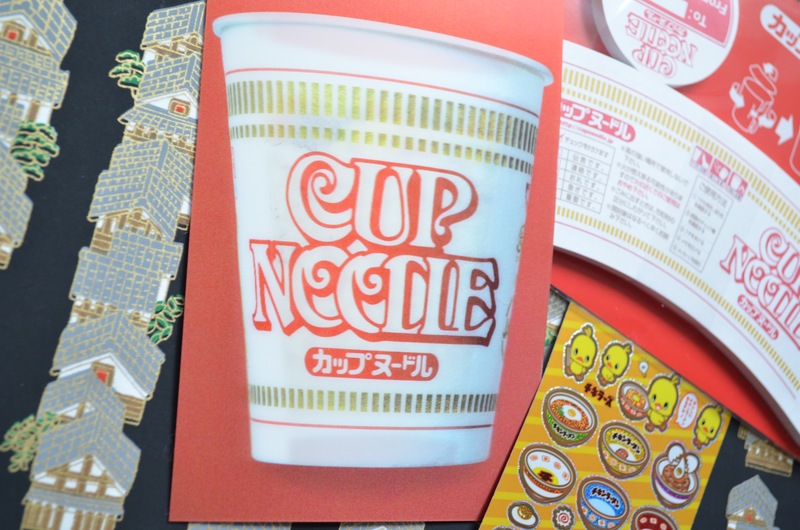 The only postcard the Cup Noodle museum sold was this hologram one. 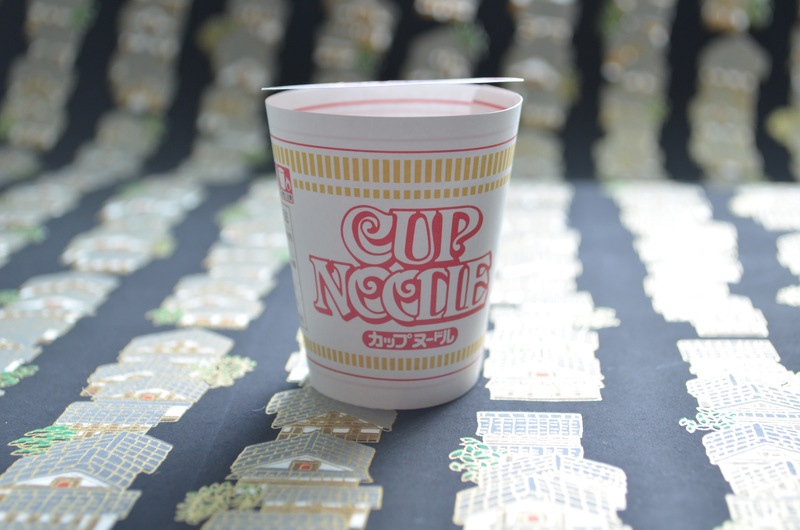 Depending on how you look at it, you can see the cup noodle or a cross-section of the ingredients (top pictures). These little Cup Noodle notes are my favorites. They’re 3-D! On the top, there’s a place to address the note. And inside, there’s a place for the message. 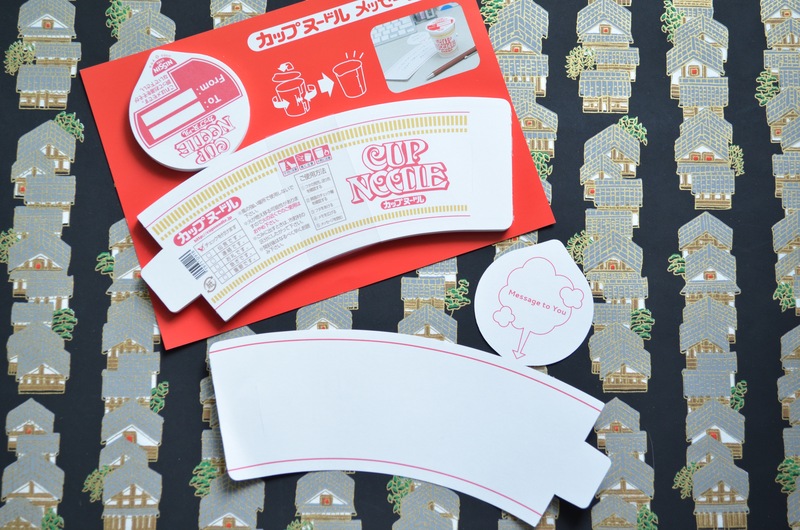 Then, roll it up, tuck in the tab and place the Cup Noodle on the recipient’s desk…a Cup Noodle note cannot be missed! (Just ask Presley. She got her treat last night!) I purchased this Ramen Log at Loft. 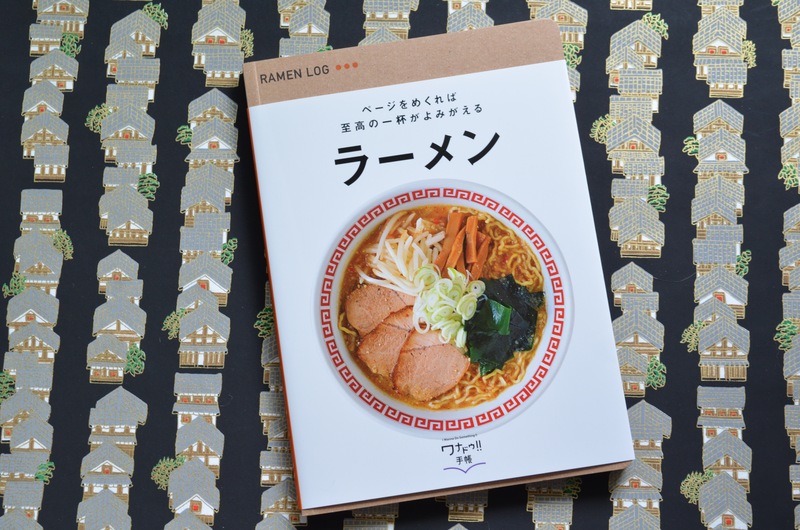 I have a failed history with book logs, movie logs, dream logs…pretty much all logs, but for some reason, I was compelled to buy a ramen log. I’m hoping, with the team effort of Naoberly’s Noodle Tour, we can keep up with it. 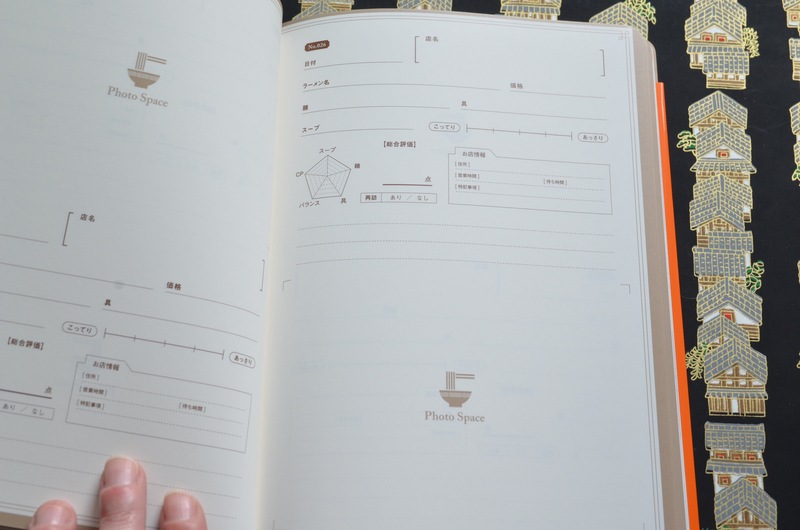 Inside, there pages and pages where you can rate the broth, noodles, and toppings and there’s a place for photos. I’m looking forward to filling up the pages with our past and future ramen stops! 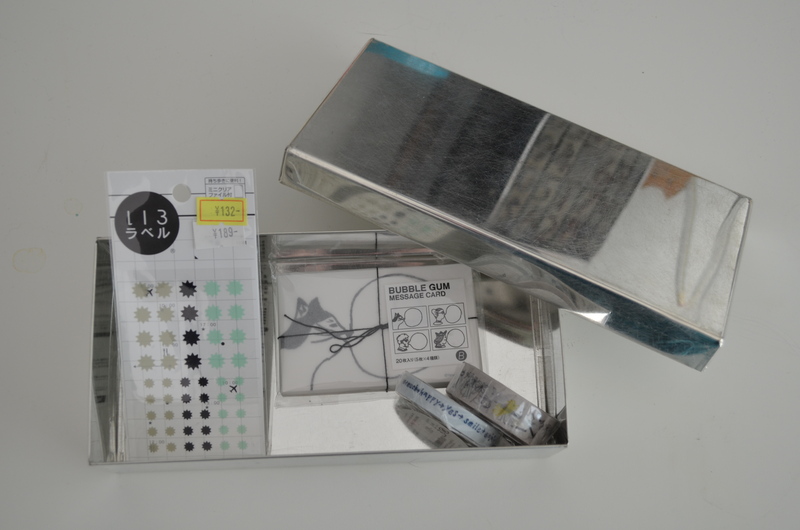 Do you have favorite souvenirs? 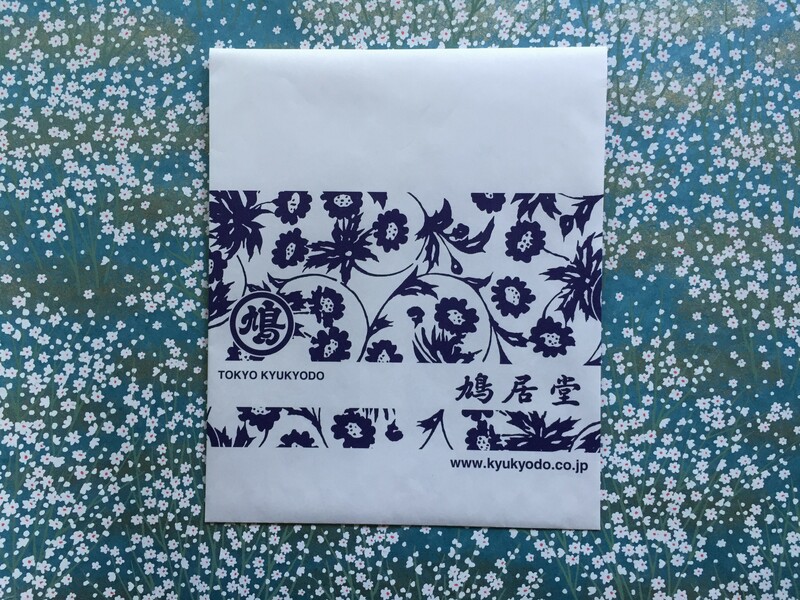 And, of course Kyukyodo has beautiful flat paper bags and will separate your purchases into the proper omiyage packages, one of my favorite things about shopping in Japan! *I apologize that I didn’t take any interior photos, but it was very busy that day and I wasn’t sure of the rules. Itoya doesn’t allow photography in its store, so I wanted to make sure I extended the same respect to Kyukyodo. 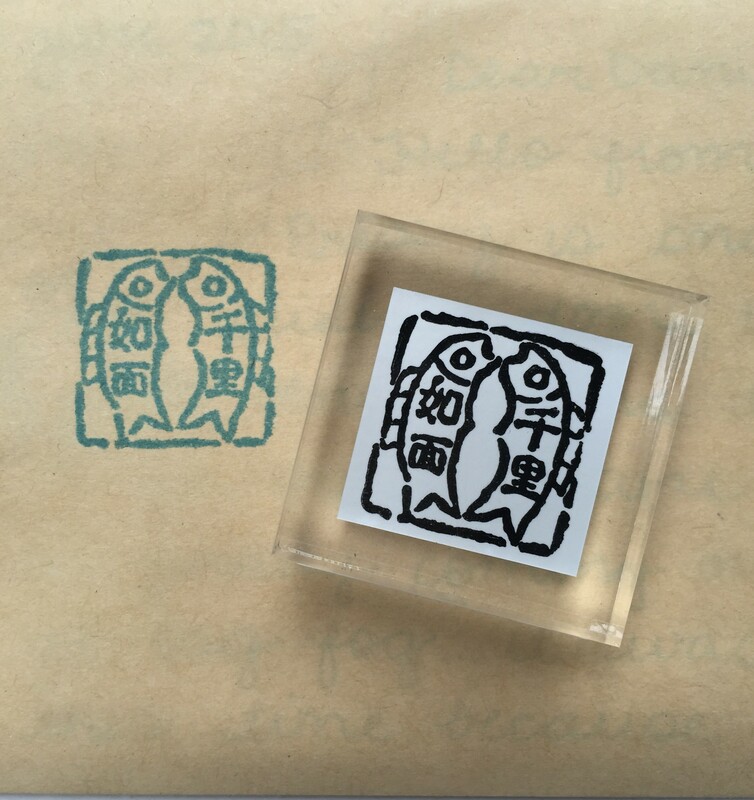 I picked up this kanji fish stamp in Itoya during our trip and I’m so excited about it. I’ve seen these stamps in previous trips and I’ve always loved the artistry and meanings. I wish I’d written down the artist’s name. 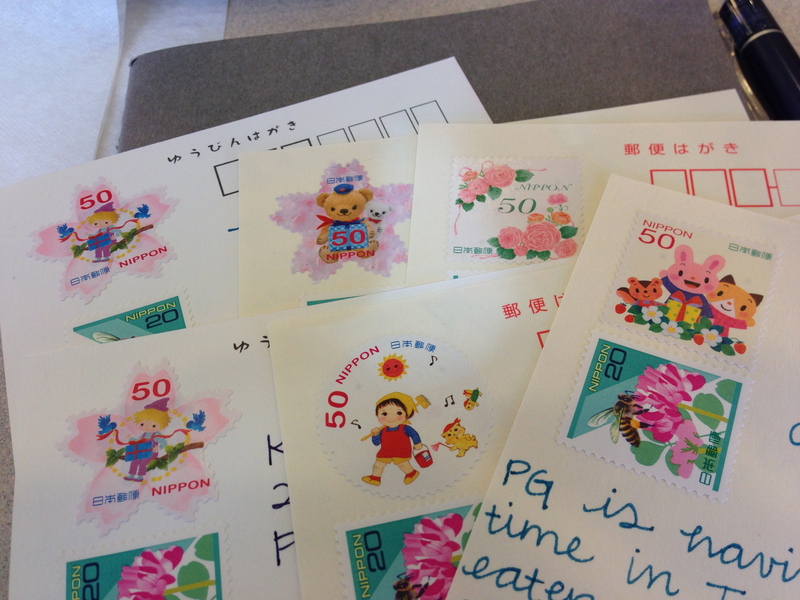 He has a whole collection of these stamps, with simple drawings mixed with kanji. This one in particular means (roughly translated) “a feeling that you are face to face even though you are far apart”. Isn’t that a perfect description of letter writing? 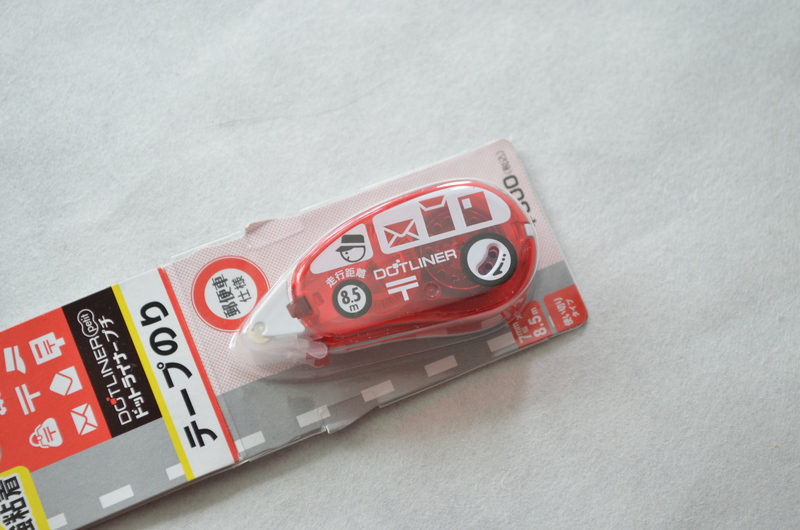 Naoto, who isn’t often impressed with rubber stamps, convinced me that I needed this stamp in my collection. I’m glad I let him talk me into buying it! Yesterday was a most beautiful day and I spent some time on the balcony writing letters and using my new stamp. I stamped it on some sticker paper and cut out a bunch of stickers to send to pen pals. 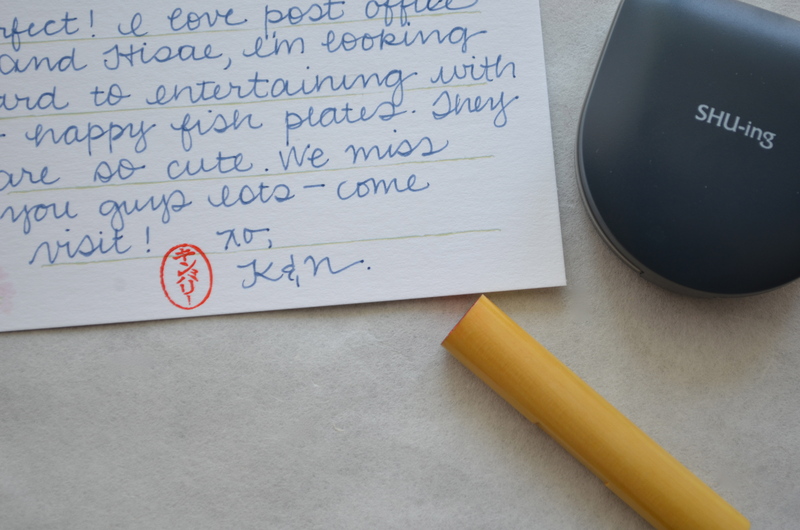 I’m very happy to share these sentiments with my letter writing friends! 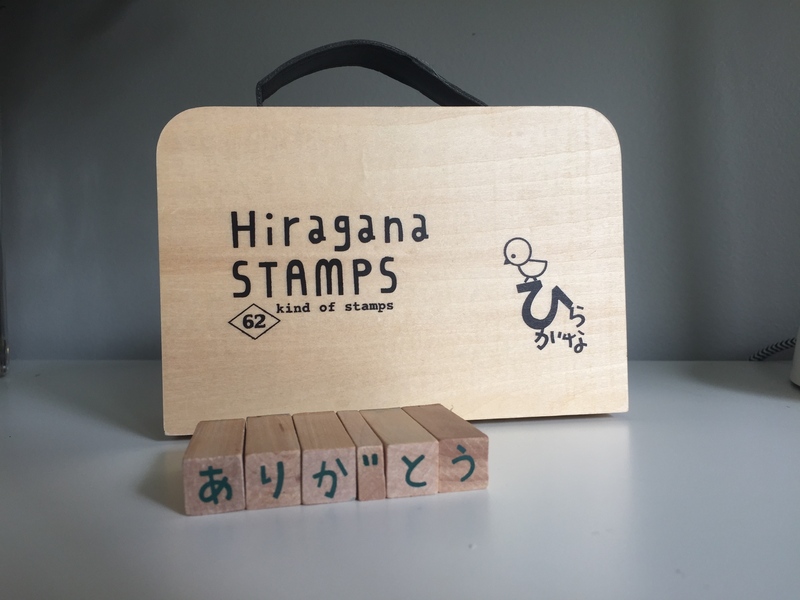 I bought these hiragana* stamps two years ago in a tiny scrapbooking store near an izakaya where Naoto and I shared dinner with his family. When I bought them, I didn’t realize how frustrating they would be to use. Every time I wanted to write something, I had to ask Naoto to spell it out for me. So I put them away in the spare room and forgot about them until recently. Every once in awhile I’d see them sitting on the shelf, taunting me and the money I’d wasted. But, now that I’ve had some practice during my Japanese class, I’m using them! I’m still pretty slow, but I can usually pick the right sounds for the words and names I’m trying to write. (Though, I still have Naoto check my work to be sure!) Here’s a peek at the whole set. (Some of the characters may be upside down because I put them away haphazardly last time.) When I use them, I have my textbook open to the hiragana chart so I can refer to it as I sound out the word. (I don’t have my hiragana sounds memorized yet…) It really does remind me of learning to read as a kid. 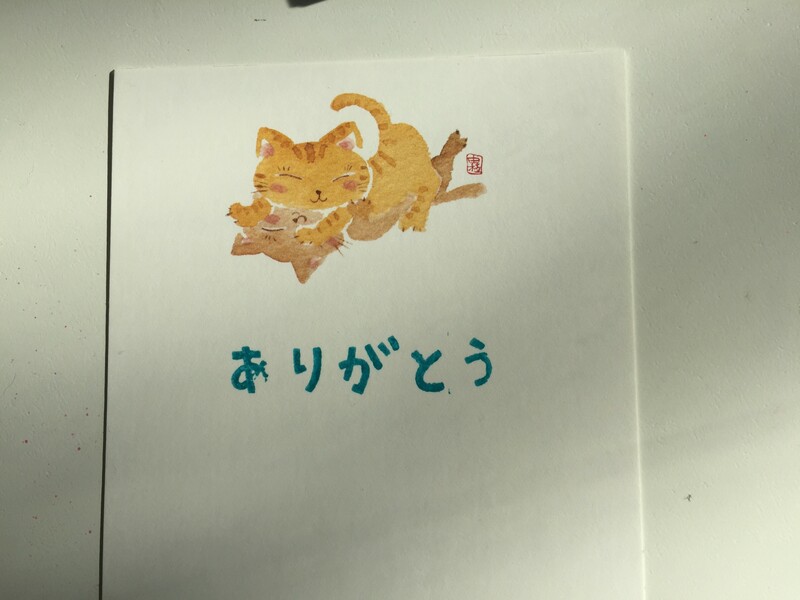 I’m slowly getting better with practice, so I’m trying to stamp a random Japanese word on outgoing mail for the rest of the month. (I’ll let you know how that goes!) 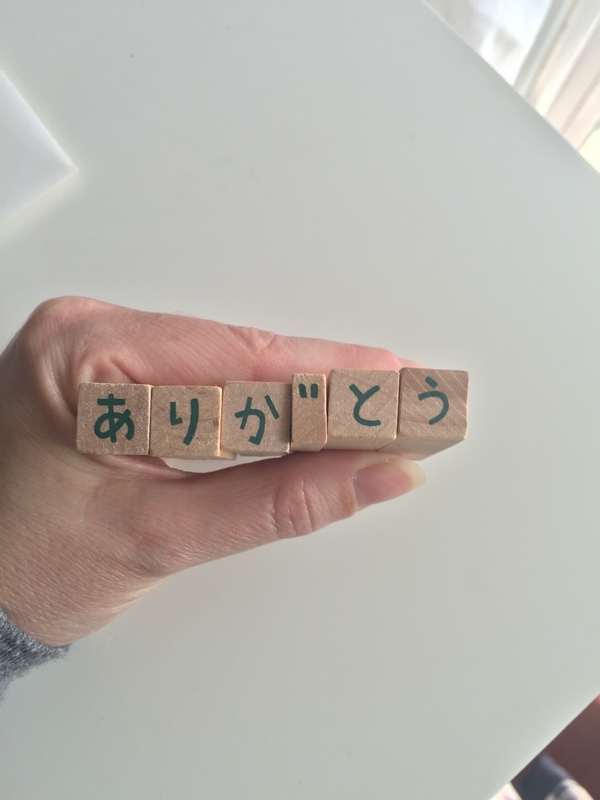 I have “arigato” (“thank you”) down thanks to writing a few thank yous lately. *If you don’t know what hiragana is, this site does a nice job of explaining it. It’s basically the Japanese phonetic script–each “letter” represents a vowel sound or a combination consonant/vowel sound. There are forty-six sounds. In some ways, they are easier than English because each sound only makes that sound. (Unlike in English where we have the long e, the short e, the silent e…) But, the letters are difficult to decipher sometimes and very challenging to write, I think. 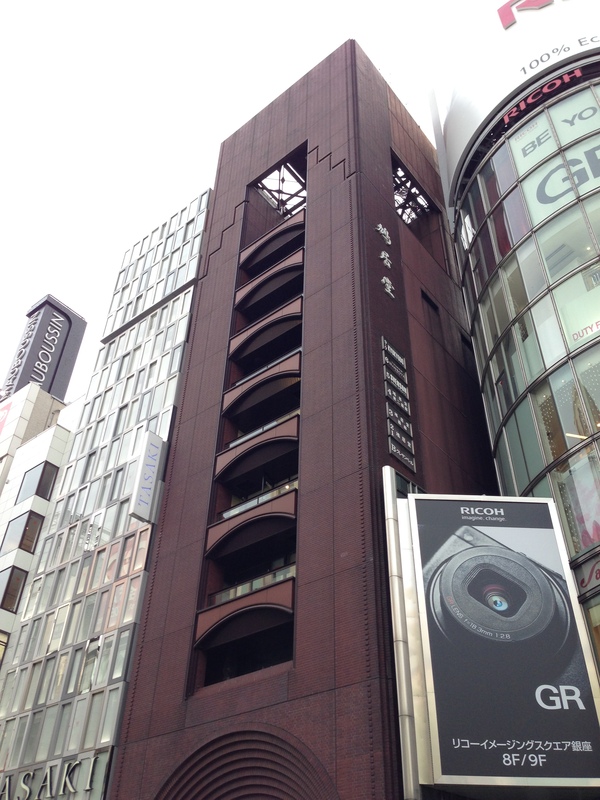 One of my favorite places to shop in Tokyo is the post office. Or, I should say, the many post offices. Of course, my favorite was our “local” PO but it was fun to get out to other locations to see the different offerings. 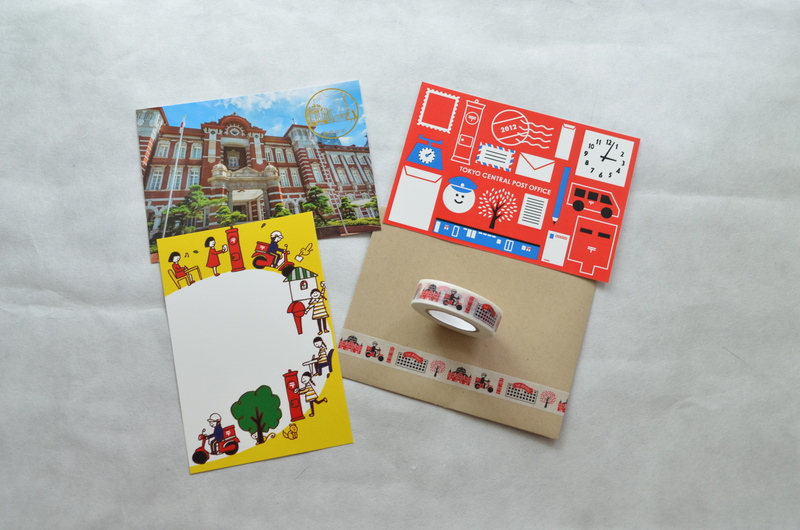 The postcards and washi tape above are from the Tokyo Central Post Office located near Tokyo Station and inside the Kitte shopping and dining center. (Kitte is Japanese for postage stamp.) Jess took us there and smiled as we walked into the post office. She knew it would be a hit. (Thanks, Jess!) 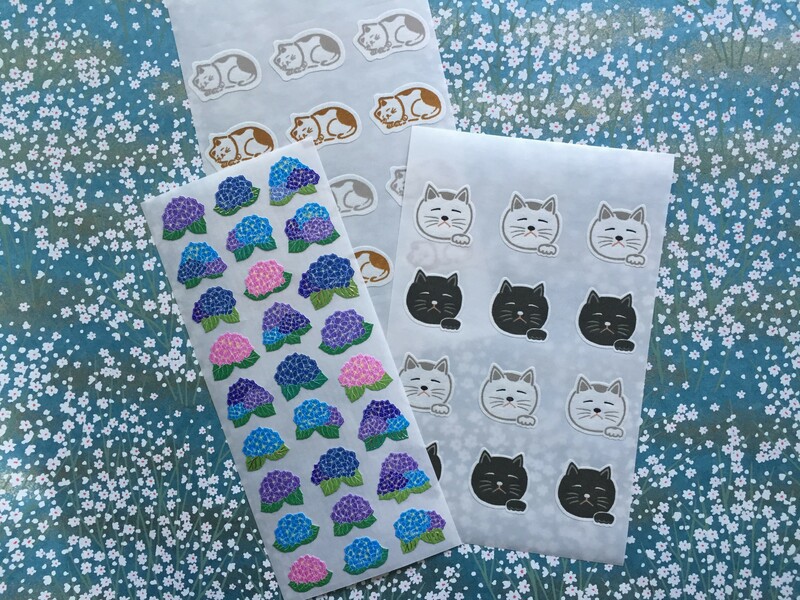 The Kitte had special washi tape made for its first anniversary. I couldn’t resist. 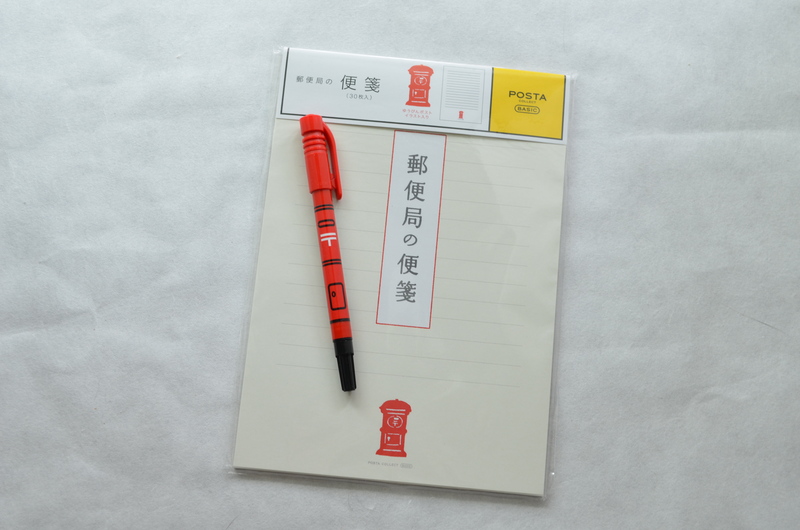 I also picked out some Posta Collect mailbox letter paper and a pen. It reminded me of the glue stick from last year. Anything that has that classic red mailbox on it is pretty much a guaranteed purchase. 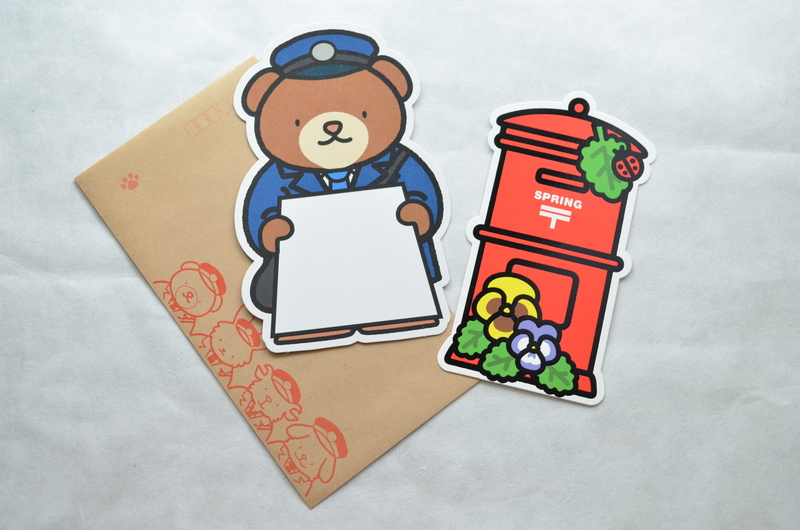 I loved the spring mailbox postcard and the big postal bear ready to deliver a big message. 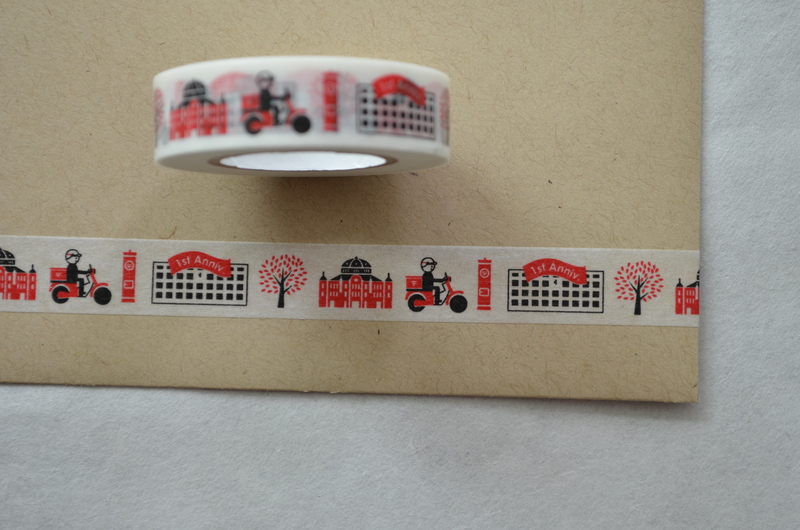 And this tiny tape runner is the perfect size for traveling and it’s shaped like a mail truck! 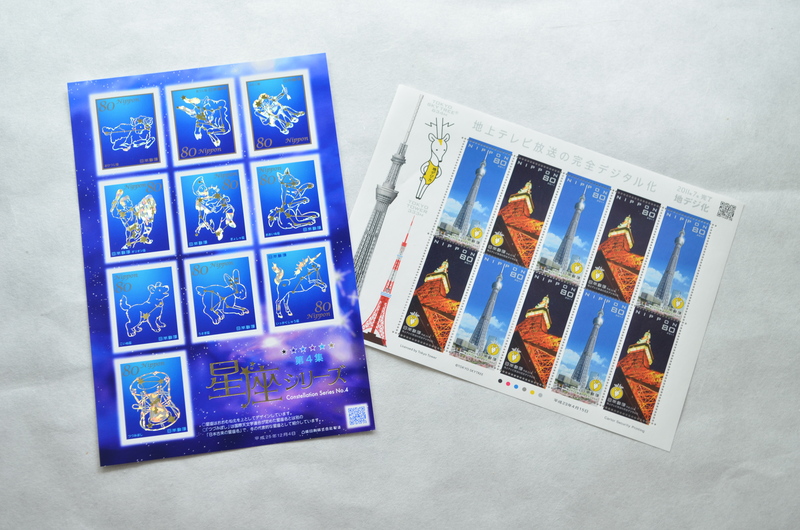 I bought the fourth set of constellation stamps and my brother-in-law, Norio gave me the other set. It’s Tokyo Skytree and Tokyo Tower. 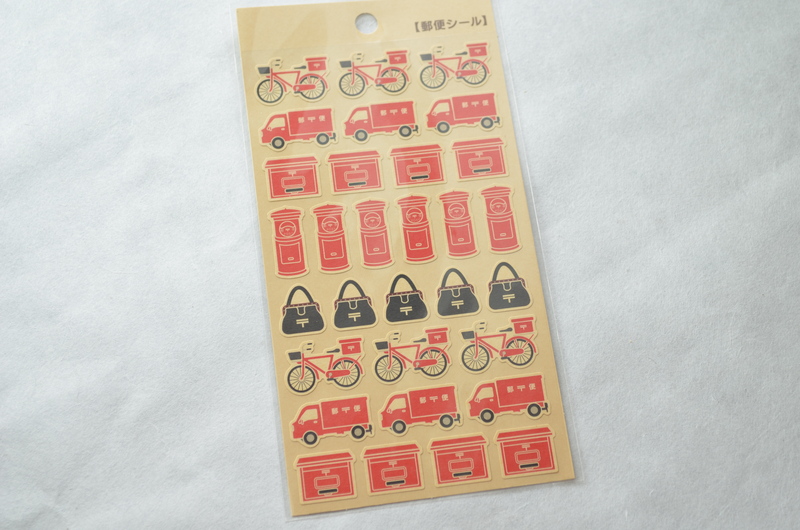 Norio also gave me these post office stickers. The bike, the mail truck, the mailboxes, the mail bags…they were the best gift ever. I love that Japan has so many postal treats. 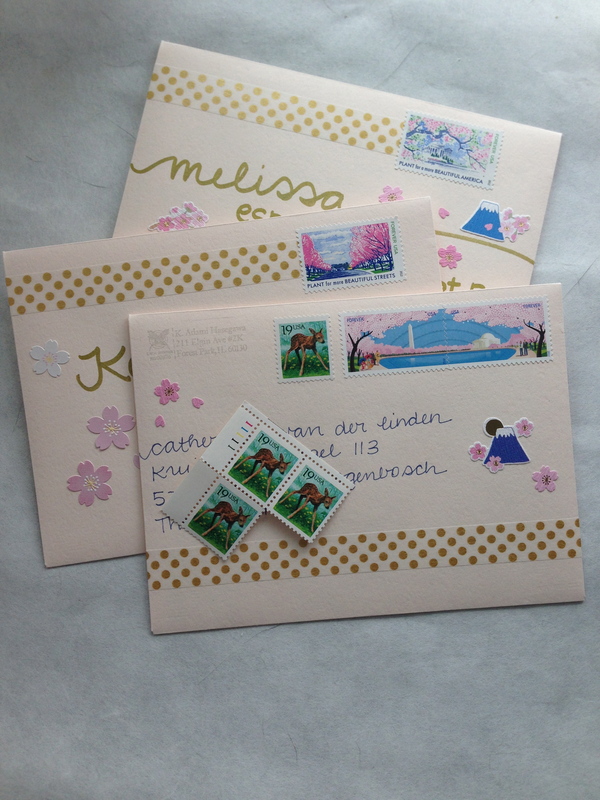 I sent out so many postcards using the spring stamps (shown above). Japan really embraces unique shapes in their postage stamps, this time using round and sakura shaped stamps. 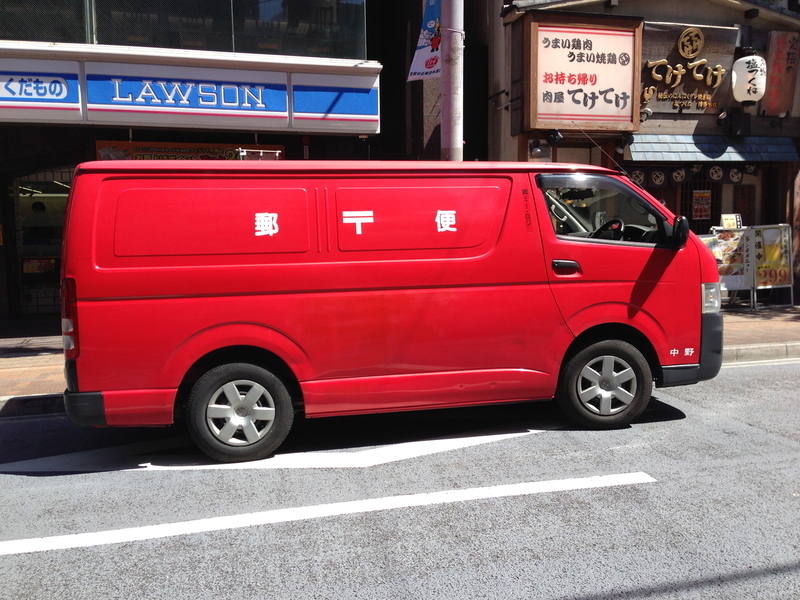 This fancy mail van was delivering packages to our hotel and Lawson’s convenience store. Yay for good mail and good mail treasures! It was hard to resist the pull of the sakura in Japan this time of year. I got swept up in sakura season mainly because I’m a sucker for that pretty pink flower, but also because things in Japan are merchandised so well…stores really get into their themes, especially when the spring flower emerges. Poor Naoto, every time he saw the pink displays, he knew we were going to linger in the store just a few minutes longer. 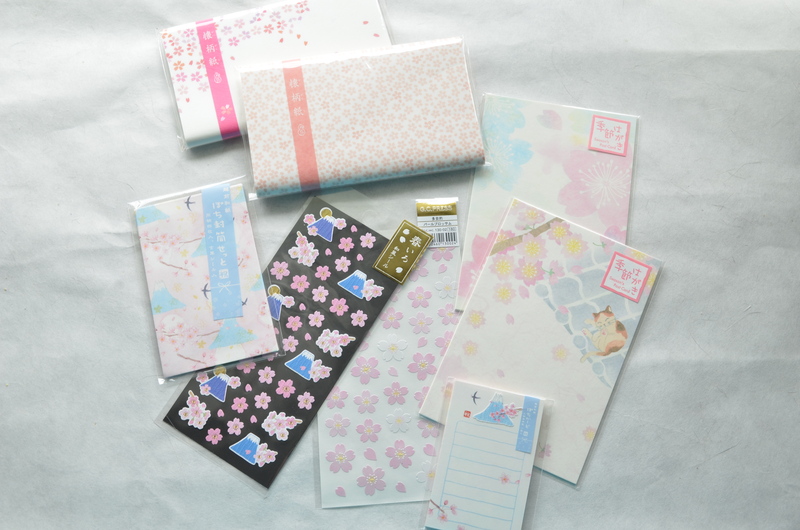 Other than the sakura postcards I sent from Japan, I came home with some extra postcards, stickers, tiny cards and envelopes and kaishi papers (the two folded stacks at the top of the picture). 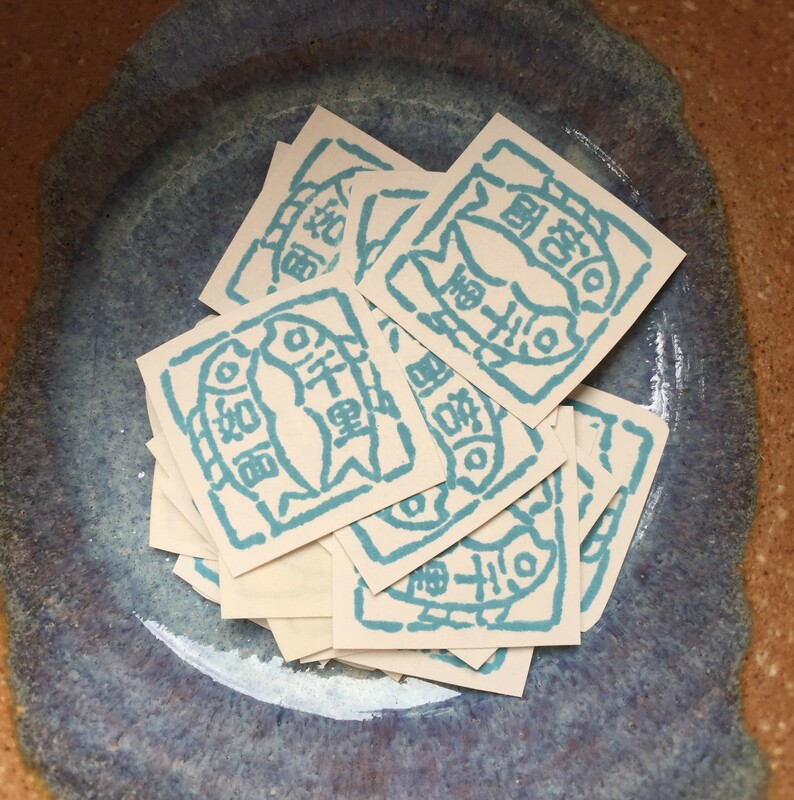 Kaishi papers are traditionally used as table decorations or mats for sweets served at tea ceremonies. 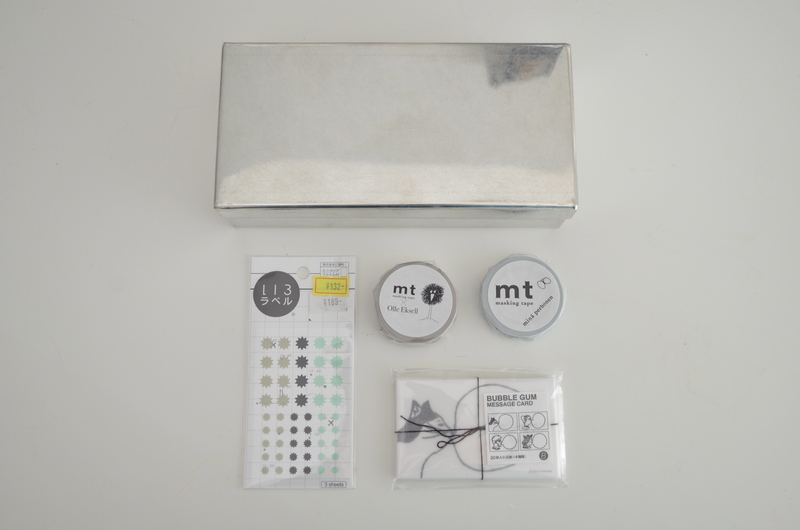 I bought some Mt. Fuji kaishi papers during our last trip and have been using them as stationery. That’s my plan for the sakura ones too. The tiny cards and envelopes are my favorites, even though they aren’t very practical. And the Mt. 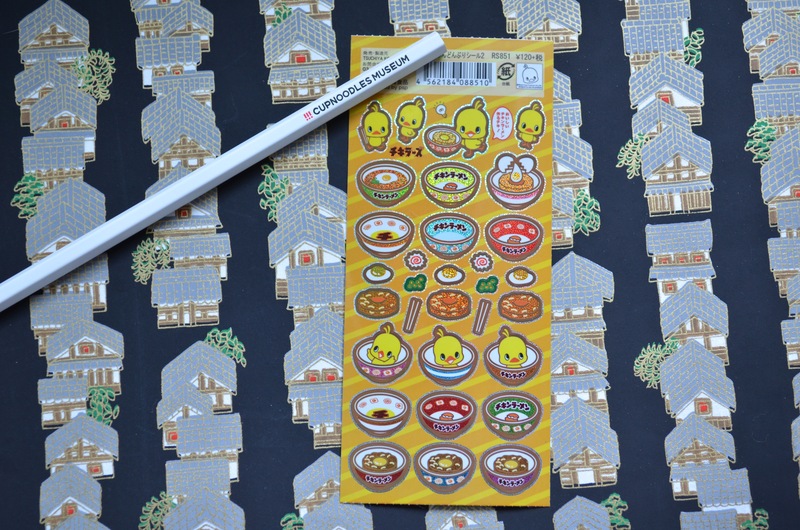 Fuji sakura stickers have a lovely texture and gold foil accents. 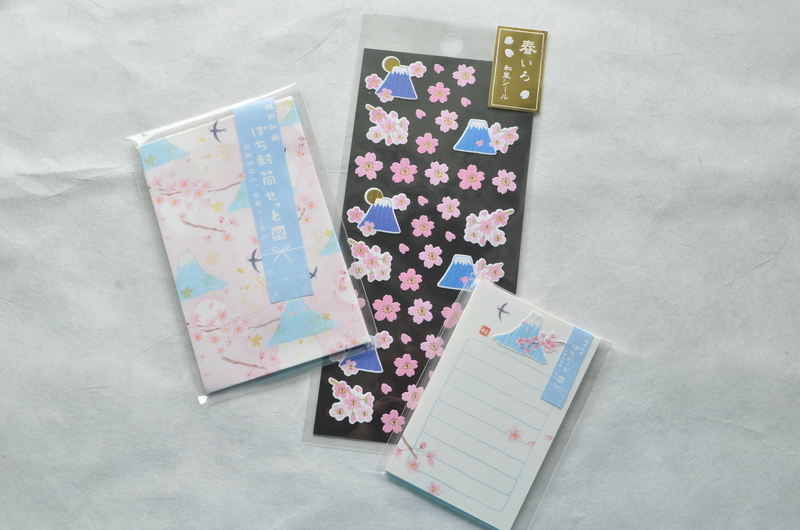 Sakura season might be over, but I’m having fun using my sakura stationery here at home. It is definitely early spring here (though it’s cold again, after our beautiful day Sunday) so sending flowery mail just feels right. Oh hey…this is my 400th post! I have many favorite purchases from my trip to Tokyo, so I’m reviving the (defunct) Spending the Yen series. On this trip, I bought a custom-made inkan. 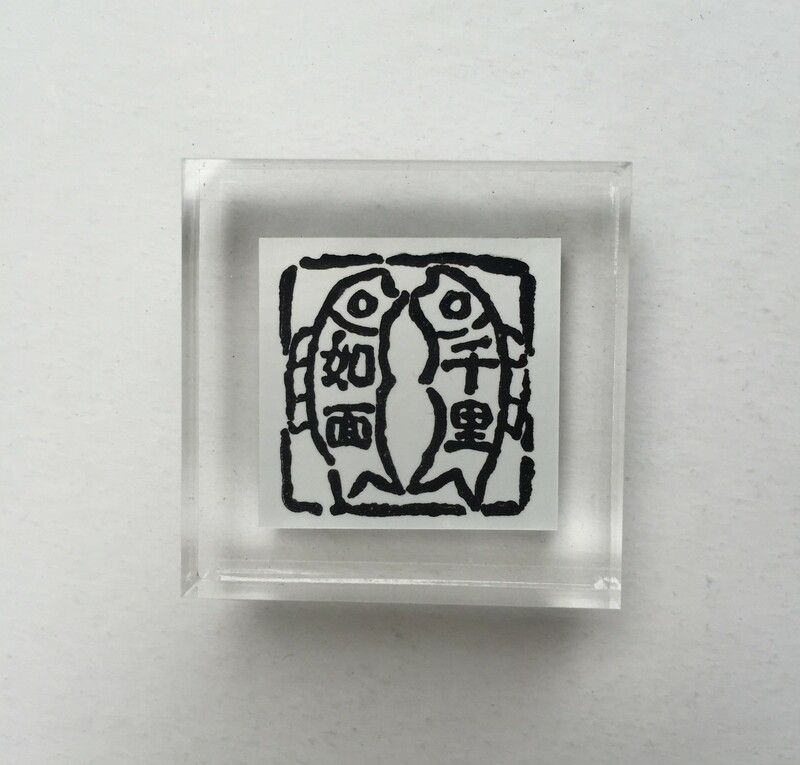 An inkan is an official stamp used in Japan (and other Asian countries) to sign important documents and contracts. 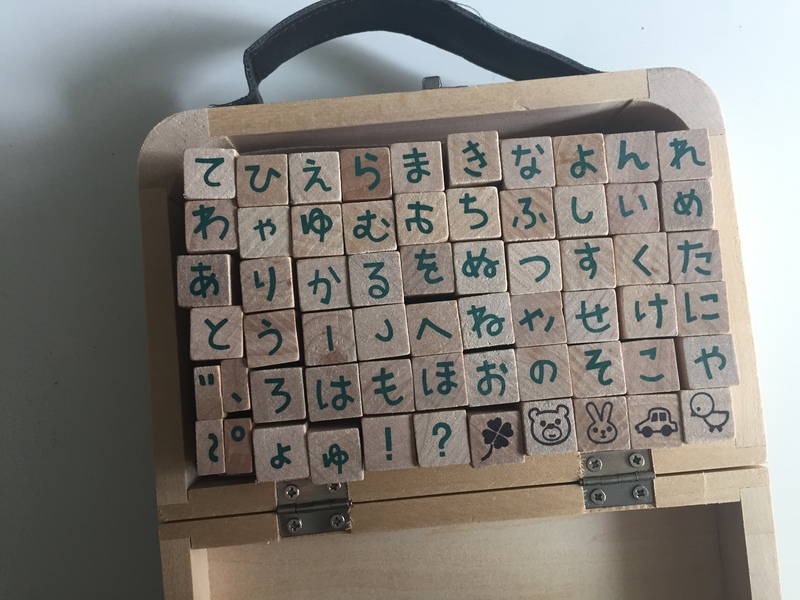 Now, I know I’m not living in Japan or signing anything important here at home, but I wanted one as a fun way to sign letters. Because it had to be custom-made, we knew going in that we had to order it at the beginning of our trip. We planned to go to Itoya to order it because we had browsed their selection last September and we had seen some inexpensive, decent styles. But as luck would have it, we got to buy it at a tiny inkan shop near Naoto’s mom’s neighborhood! We happened upon the shop while waiting for Naoto’s sister to join us before visiting their mom. The shop owner was wonderful to work with, explaining the choices of materials and the process of making the inkan…I love shopping with small businesses! I chose Japanese cedar because it was budget-friendly and natural. 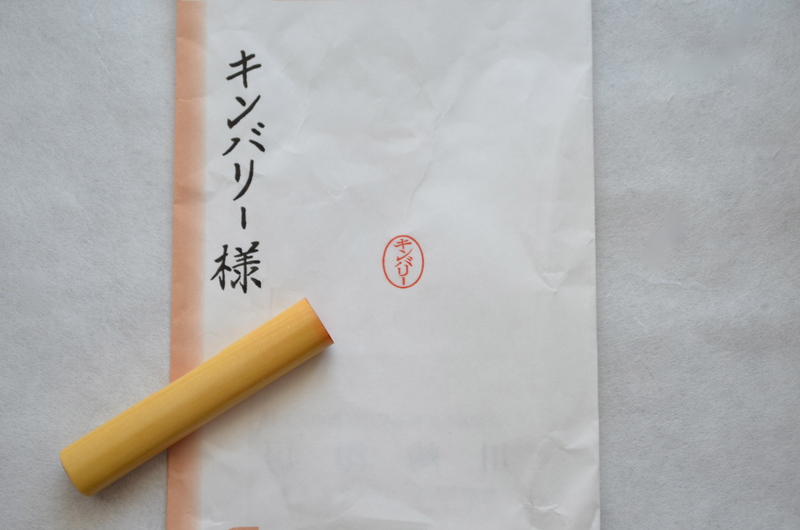 A really special inkan can costs hundreds of dollars. I didn’t need anything that serious.The characters that “spell” Kimberly are delicately carved out of the wood. The stamped image is about a half inch tall and I love that it’s oval. (My name is too long for a round stamp.) We picked up the stamp a week later and it was packaged (complete with a little ink pad and case) in the bag you see above. Along the side, the shop owner wrote “Miss Kimberly”. 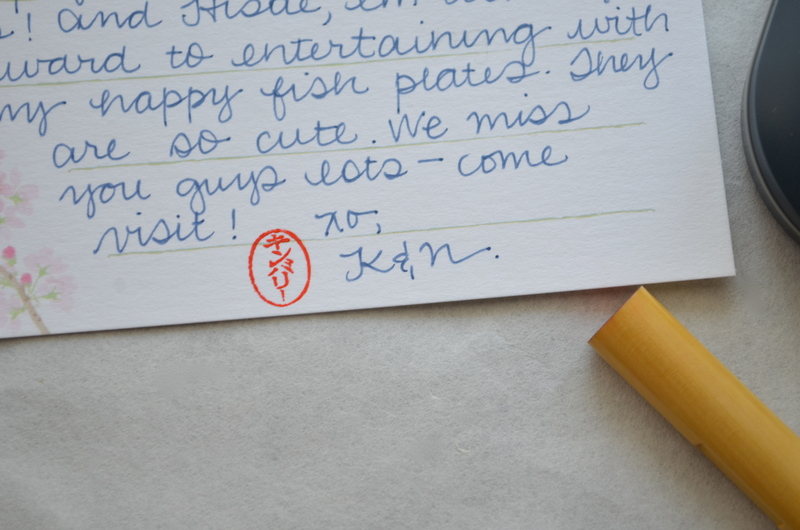 I wrote a couple of thank yous and Easter cards last week and used my inkan to sign them. Official, right? I love having a little piece of handmade Japan on my desk to remind me of our trip, bunbougu cafe and (most importantly) to keep my desk clean!